Only 5 left in stock - Order today! Behind the pocket doors hides the perfect space to store your wine and spirits out of sight but within easy reach. Each of the two interior compartments can be used to house a 28-bottle wine refrigerator. The left side compartment includes two sliding, removable shelves. Espresso finish. If you purchase this without the wine refrigerator does the right side have shelves? BEST ANSWER: The Firenze Mezzo Wine and Spirits Credenza shelves are removable and yes, you can fit a beverage center in this credenza. Please call our sales department at 800.356.8466 and they can assist you with this. Thank you. Yes. I have a dual temp wine frig on one side and a bev center on the other. I get a lot of compliments on it. I did not buy either from WE. The shelves are removable but you have to measure the interior to see what will fit in the space. Can I get a dual zone refrigerator rather than the single zone? BEST ANSWER: A 24 bottle dual zone can substitute the 28 bottle that comes with the Firenze. If you opt to have the shelving on both sides would they be fixed or adjustable on the right? Or can you request the slide out drawers for both sides. Also, are there options for the hardware finish? Is the back solid wood? Can this be used as a freestanding unit and not against a wall? BEST ANSWER: No, it's got a pressboard back so cannot be used freestanding. Also the shelves that hold the liquor bottles are narrow and you cannot put large liquor bottles in there. Other than that it's great. No. It’s a pressed wood that has a cardboard feel. I wouldn’t recommend it being freestanding. The back isn’t pretty enough to not be up against a wall. Does it come in any other colors? Antique white? BEST ANSWER: The Firenze Mezzo Wine and Spirits Credenza also comes in black. It does not come in antique white. BEST ANSWER: Short answer - NO, that won't fit. The dual-zone fridge they offer is 18" w X 29" h. You could fit up to a 21" w x 31" h in the cabinet. The cabinet has an open back, so depth is not really an issue. The fridge you have will be to big. The suggested dimension are:29- 1/2" H X 17- 3/4" W X 21" D" . Do the shelves have removable inserts? If we wanted to use for ice bucket storage for example? 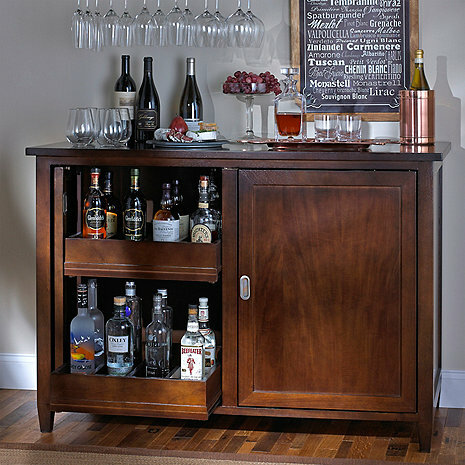 BEST ANSWER: The Firenze Mezzo Wine and Spirits Credenza has two interior compartments which can be used to house a 28-bottle wine refrigerator. The left side compartment includes two sliding, removable shelves. Does this unit have the removable backing to provide ventilation for a refrigerator? BEST ANSWER: Yes, the back panel needs to be removed for venting one of our WE fridges.